The National Rural Assembly is pleased to launch a webinar series that will explore rural policy opportunities at both the state and federal level. We invite you to participate in our first webinar on July 29, 2010 @2pm-3pm Eastern for a broad scan of rural policy issues, looking at rural economic development, energy and the environment, health care, and education. This webinar is free and open to all who wish to join, but you must first REGISTER here. * How do we strengthen the presence of rural on an urban-centered national policy stage? * How can federal tax policy be used stimulate more private investment in rural America? * What's the status of broadband's Title II reclassification? * What do new tax credits for solar investment and other alternative energy technologies mean for state policies on renewable energy, and how does rural development relate to these debates? * What are the new opportunities for income generation in low-wealth areas? 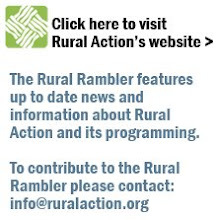 * How is federal health care reform being implemented, and what does it mean for rural areas? * How will increased support for community colleges affect rural youth? Panelists for this session will include Anita Brown-Graham, Director of the Institute for Emerging Issues at North Carolina State University, and Dee Davis, President of the Center for Rural Strategies in Whitesburg, Kentucky. Ample time will be set aside for questions and answers.